At the last vPTG , the Searchlight team decided to do a release for Searchlight projects at the Stein-1 milestone. Even though a discussion of the release management team has agreed to move the 'cycle-with-milestones' to 'cycle-with-rc' model , we still need to release this time to evaluate our effort of reviving Searchlight. And finally, we reached the milestone, and today I was doing a release. The patch is being reviewed on gerrit . ES 5.x support Fix bugsVersioned Nova notifications tox use py3 by defaultDocs clean up Awesome!!!! Making Searchlight work with the versioned Nova notifications : This feature originated from a Nova feature  proposed for the Pike release but could not be done at that time. At the last vPTG , the Searchlight team decided to include this feature in the Stein cycle.Change python3.5 job to python3.7 job on Stein+ : because the conversation about this  is still going on so we want to wait a little bit.Talk at the OpenStack Korea User Group on 19th Oct. in Gangnam, Seoul, South Korea : I was trying to tell everybody the story of Searchlight and why it needs more contributors. The impression was good. That's it for last week. 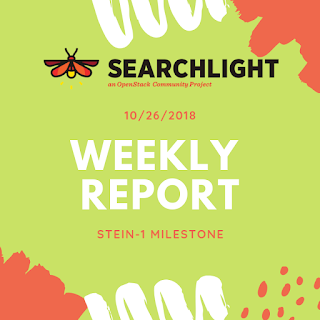 At the end this week, we have to release searchlight, python-searchlightclient, searchlight-ui for the Stein-1 milestone. It is not required but I would want to do it to evaluate our effort in the new cycle of OpenStack. Last Friday, I had an opportunity to tell the story of Searchlight to the OpenStack Korea User Group in Seoul. My ultimate goal is to attract new contributors and to revive Searchlight. In just 30 minutes I worked people through the history of Searchlight, its architecture, and the current situation. Everybody seems to get the idea of why Searchlight needs their help. Even though not all of the attendants could understand my English, with the help of Ian Y. Choi, the organizer, and core of the OpenStack Docs and I18N team, the communication was great. Hopefully, I will have another chance to discuss with everybody more about Searchlight. I think it's good to have a weekly report for others to know what is going on with Searchlight. So from now on, I will write a weekly report every Saturday starting this week as well as setting the goals for next week.